The Evangelization Kit is everything you need to run the ChristLife Process at your parish – at a 15% discount! 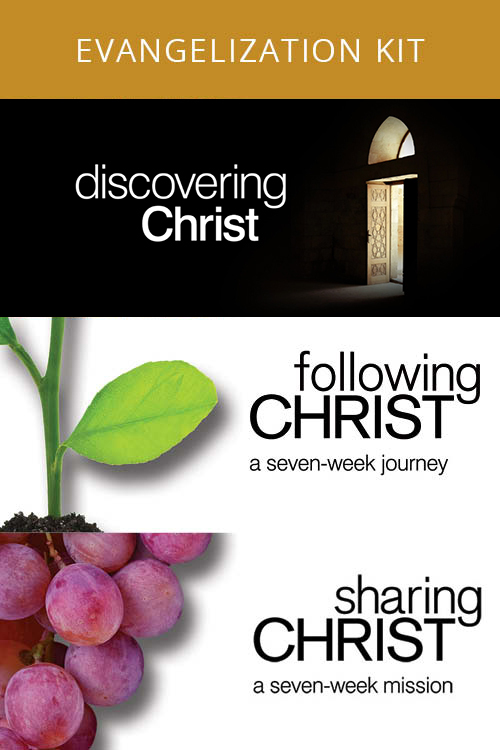 The ChristLife Process - Discovering Christ, Following Christ, and Sharing Christ - will establish a process of evangelization at your parish where parishioners and guests alike are invited to encounter Christ, learn to follow Him, and become missionary disciples. With the Complete Kit, you have everything you need to run the ChristLife Process start to finish. With the Printing Licenses included, there is no need to buy any additional guides, simply print off the number of Facilitator Guides and Participant Guides your courses require. Included in the Complete Evangelization Kit are the Printing Licenses. The Printing Licenses give you permission to print and share the course guides an unlimited number of times. These all-inclusive licenses contain all of the relevant guides for each course. You will be given the guides in PDF format, allowing for easy printing and file sharing. After purchasing, you will receive a zip file download containing the guides for all three courses in PDF format. The Printing Licenses is a wise investment for any parish that wishes to run the ChristLife Process multiple times. Interested in the Evangelization Kit without the Printing Licences? See the Basic Evangelization Kit. Learn more about the ChristLife Process.